But it was the late 1930s, and the ornate building by which the statue had been placed in 1908...the red sandstone courthouse at Broadway and Temple Street...was gone, razed after it was damaged beyond repair in the 1933 Long Beach earthquake. The monument to White, which faced Broadway, was now on a grass-covered vacant lot, with the Spring Street side of Los Angeles City Hall in the background, a block behind it…as seen on the post card at left. 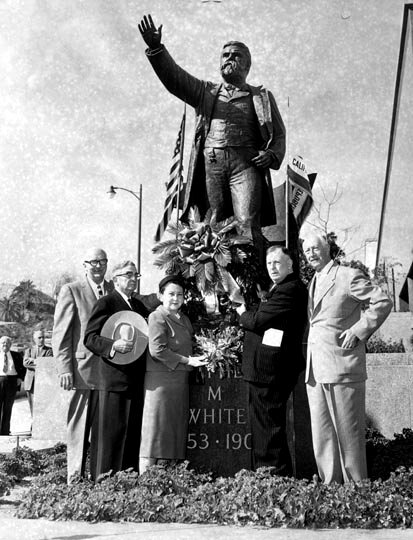 The statue of White had been sculpted through funds privately donated, and was a gift to the state, though standing on county-owned property. It was fitting that the statue be placed in the Civic Center, for it was there that White, who died in 1901, had practiced law, including his stint from 1883-85 as district attorney. However, about half a century had gone by since White tried cases in downtown courtrooms, and even memories of his later service as a state senator, lieutenant governor, and U.S. senator were dimming. 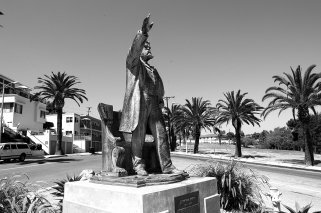 On the other hand, residents of the San Pedro area of the city—where a deep-water harbor had been constructed with federal funds as a result of White’s determined efforts— coveted the statue. Two years later, a bill again passed the Legislature, and the new governor, Culbert Olson, signed it. However, the Native Sons of the Golden West exerted its influence, and despite the legislation, the statue wasn’t moved. 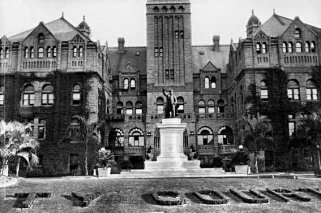 During the 1940s, the statue was not so isolated; bungalows were constructed on the former site of the 1891 sandstone courthouse, at least some of them housing courtrooms. 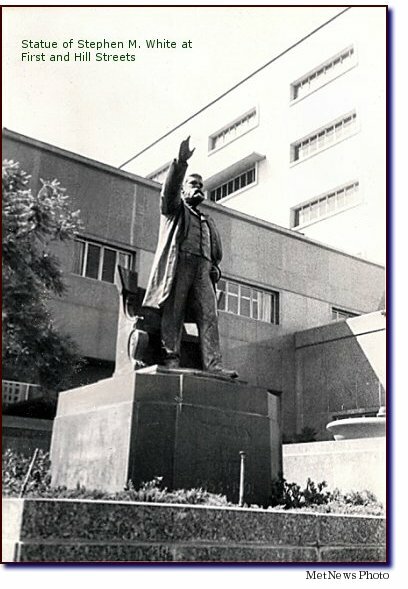 “The statue of Sen. Stephen M. White, the ‘father of Los Angeles Harbor,’ was moved yesterday from the Civic Center site where it has stood for the past 50 years. “The late Stephen M. White...was honored at brief ceremonies in front of the County Courthouse on the 107th anniversary of his birth. Photo from Herald-Examiner, bearing caption: “A group has gathered to place a memorial wreath before the Courthouse statue of Stephen M. White. Left to right: John B. Schmolle, grand president, Native Sons of the Golden West; Eugene Biscailuz, ex-Sheriff; Mrs. Frances Sullivan; John C. Crowe, chairman; and Eldred L. Meyer, past grand president, Native Sons.” Courtesy of photo archives, Los Angeles Public Library. 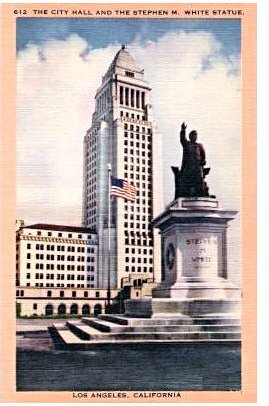 “Old-timers of Los Angeles beamed in delight when they learned the statue of Stephen M White (1853-1901), Los Angeles district attorney and then Democratic Senator from California, had been draped with green muslin in its eloquent position before the new courthouse, First and Hill Sts. “Four pieces of the green cloth formed a toga, a sash and two scarfs. “On Monday, while Neil Armstrong and Buzz Aldrin were in orbit around the conquered moon, heading for their rendezvous with Mike Collins, I took a walk in the civic center mall. “I stood for a minute in front of an heroic bronze statute at the Hill St. entrance of the county courthouse. The subject is a stubby man, comfortably overweight, in the fashion of his time, with a Ulysses S. Grant beard. He wears an ill-cut suit with a frock coat and trousers that hang low at his heel and break twice at the ankle. “His coat is open to show an unkempt six–button vest. His bow tie is askew against a wing collar. The whole impression is that of a man who has slept on a bus. “His left thumb is stuck in a pocket. His right arm is raised and extended in what is probably meant to be a visionary gesture. “It is a face and figure that nobody could place without reading the name on the pedestal: Stephen M. White. That column does lend credence to the notion that White’s link to the harbor was better remembered at that point than his service as DA. Stephen White’s great granddaughter, Lindalouise White De Mattei, tells me that in the 1980s, there was a group in San Pedro that wanted to make yet another try at getting the statue moved near the harbor. She recites that the group contacted her father, Stephen N. White (since deceased), and drove up to Los Gatos “to meet with him to get his blessing” for their efforts…which he withheld. The family had, through the years, opposed relocation of the statue from the Civic Center, where White had been in private practice and served as district attorney and where he had been married, in St. Vibiana’s Cathedral. She credits Supervisor Kenneth Hahn (also deceased) with getting the statue moved back to the Civic Center in late March, 1988. As part of the construction of the Metro Rail project, the RTD has committed an outrageous and thoughtless act by removing the statue of former United States Senator Stephen White from outside the County Courthouse and placing it for the foreseeable future in a dirty storage yard. Stephen White was a great leader for Los Angeles County, for California and for the nation. His contributions—especially his leadership in establishing the Los Angeles Harbor—should not be forgotten just because they were achieved in the last century. THEREFORE, I MOVE that the Chief Administrative Officer be instructed to arrange for the retrieval of the statue of Stephen White from the RTD and placed at a suitable location outside the County Courthouse so that he will once again stand proudly pointing in the direction of the harbor he helped create. The rescued statue was placed not on its old site, at the corner of First and Hill, but was positioned on the Municipal Court side of the building, at First Street and Grand Avenue. But it wasn’t there long. 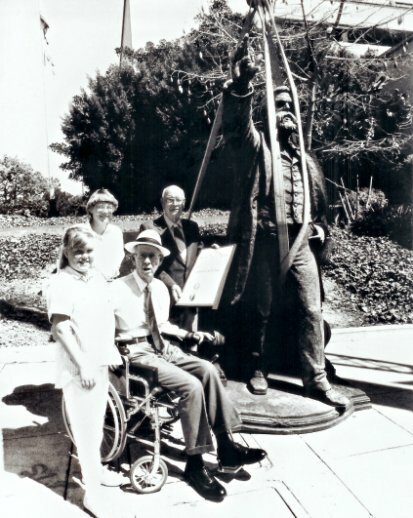 Supervisor Kenneth Hahn (seated) is seen at the 1988 rededication of the statue on the Grand Avenue side of the Central Courthouse (now named after Stanley Mosk). Participating are, from left, Carrie Baer, great-great granddaughter of White; Catherine Baer, his great granddaughter; and grandson Stephen N. White. The office of Deane Dana, then supervisor from the Fourth District (which includes San Pedro), had gotten behind efforts of the Stephen M. White Statue Committee. Dana’s chief deputy for the San Pedro area, Mitch Maricich, was working closely with the group. Maricich died in 2002 and Dana died last year. But institutional memory of the events persists. A spokesperson for the current Fourth District supervisor, Don Knabe, says that in light of an impending widening of Grand Avenue and installation of ramps to provide handicap access to the courthouse, the statue had to be moved, once again. As long as it was to be uprooted, anyway, “the Fourth District decided” to put the statue in San Pedro, he explains. “Unanimously and without discussion,” a Los Angeles Times article of Sept. 22, 1988, says, the Board of Supervisors approved the relocation to the harbor area—thus giving effect to state legislation enacted 49 years earlier. There it stands, after a campaign by denizens of the area that stretched over more than half a century. Statue of White in front of red sandstone courthouse on Broadway, its original home. Statue as it appears today on Stephen M. White Drive in San Pedro. Moving on from Stephen M. White—who was probably the most illustrious of the men who have served as Los Angeles district attorney—I’ll discuss next the most obscure DA in the county’s history.